Muslim leaders at a summit in Istanbul have condemned President Donald Trump's recognition of Jerusalem as the capital of Israel. 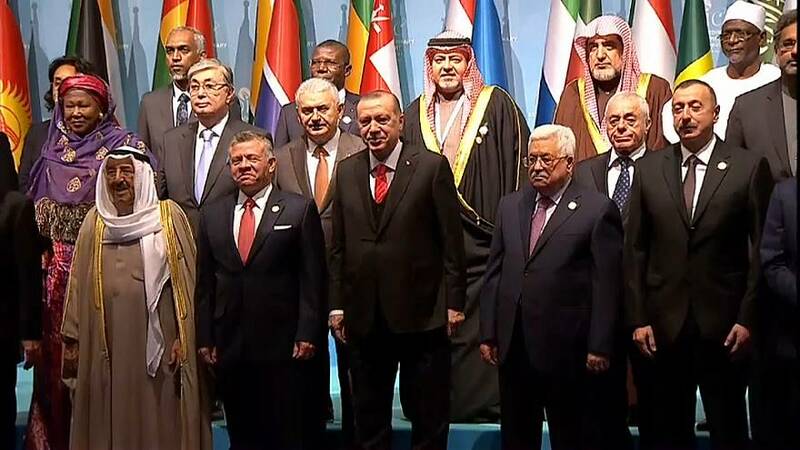 Turkey's foreign minister tweeted the final communique from the meeting of the Organisation of Islamic Cooperation (OIC) which said the US President's decision was "null and void" and called on the world to recognise East Jerusalem as the Palestinian capital. There was sharp criticism of Trump from Palestinian President Mahmoud Abbas who described his Jerusalem move as a "crime". "We don't accept, as Palestinians, Arabs and Muslims, we are no longer able to (accept) the role of America as mediator for which the basic necessary condition is unbiased integrity," Abbas added. Trump's declaration last week coupled with the intention to move the US embassy from Tel Aviv to Jerusalem have been applauded by Benjamin Netanyahu. On Wednesday the Israeli prime minister urged the Palestinians to halt what he called "extremist statements" and to work for peace. Meanwhile in the West bank city of Ramallah several dozen Palestinian protesters took to the streets, burning tires and clashing with Israeli forces. Israeli undercover officers reportedly went on to make arrests. Several days of street protests in the Palestinian territories over Trump's announcement have largely died down, but there continues to be international concern about its impact on the "on-off" peace process.